Gresham House, known today as the Bishop's Palace. Galveston, TX. I'll concede that the old Gresham House in Galveston does not crown a hill, but it can certainly pass for a castle. 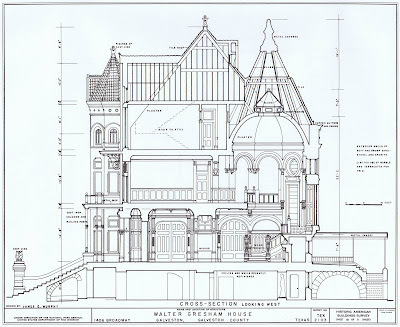 Architect Nicholas Clayton designed the house (1887-1892) for attorney and legislator Walter Gresham and his wife Josephine in a mix of styles that historians call "Chateauesque". 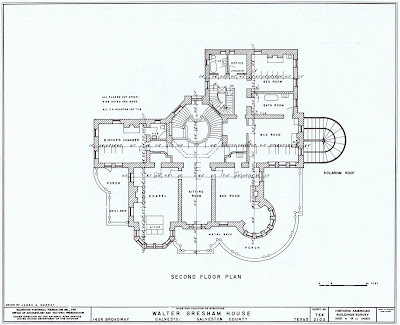 Perhaps it was the heat of the island, or perhaps it was Mr. Gresham's wish to exhibit his newly acquired wealth, but the truth is that Gresham House takes the exuberance typical of Victorian Architecture to new levels, and is without a doubt the crowning glory of Broadway Avenue. The Bishop's Palace. View from Broadway. Galveston, TX. The sculpted granite, limestone, and sandstone exterior of the house seamlessly combines elements of French Gothic, Romanesque, Tudor, and Classical architecture along with details contemporary to its time. Renaissance Serlian windows and Baroque Mansard roofs sit happily next to the crenellation, turrets, and gargoyles. The Bishop's Palace in Galveston, TX is a National Landmark in the National Register of Historic Places. Limestone and Granite columns decorate the facade of the Bishop's Palace. The Bishop's Palace. First Floor. Galveston, TX. The Bishop's Palace. Second Floor. Galveston, TX. Mr. and Mrs. Gresham spared no expense when it came to the interior of the house, which is luxuriously decorated with intricate paneling and carvings of precious woods and stones. The Bishop's Palace Library. Galveston, TX. 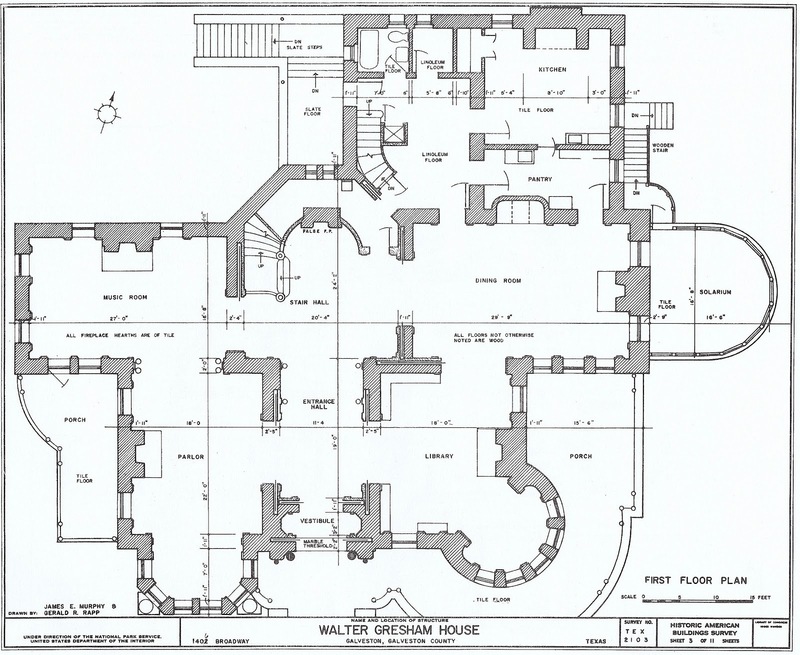 The Library (above) is located across the hall from the Parlor (ballroom), and is appointed with painted walls and ceiling, an red African marble fireplace, and innovative pocket doors. Each side of the doors is paneled in a different species of wood, to match the facing room. The Bishop's Palace Music Room. Image by the Galveston Historical Foundation. The Music room occupies the northwest corner of the first floor, and is conveniently adjacent to the Parlor. The walls of the music room and parlor are covered in silk upholstery. A painting by Mrs. Gresham of two of children sits above the music room's fireplace. The children are portrayed as angels alluding to their untimely death. 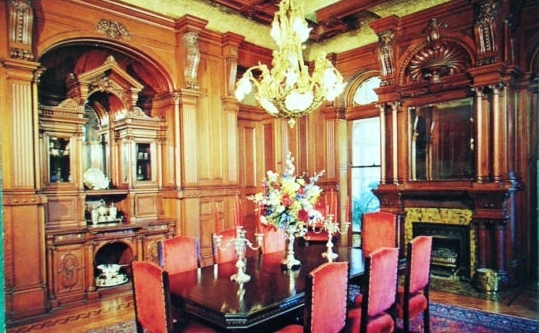 The Dining Room in a vintage postcard. The shutters in open position. The shutters in closed position. 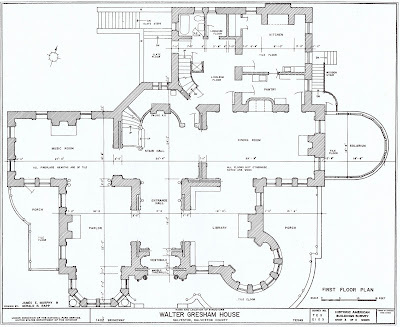 The gas fireplace in the Stair Hall; a balcony whence Mrs. Gresham would address her brood, occupies the place where the chimney flue should be. 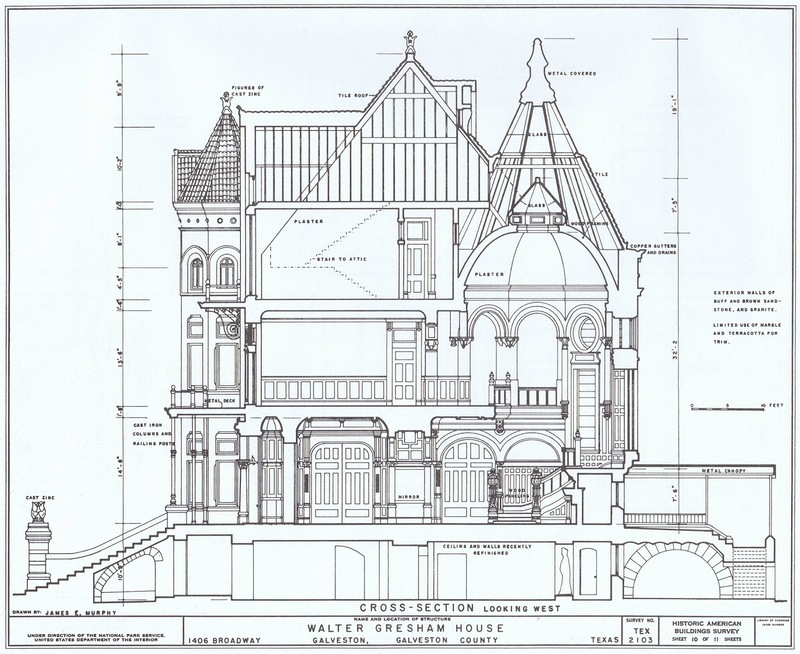 Image by the Galveston Historical Foundation. 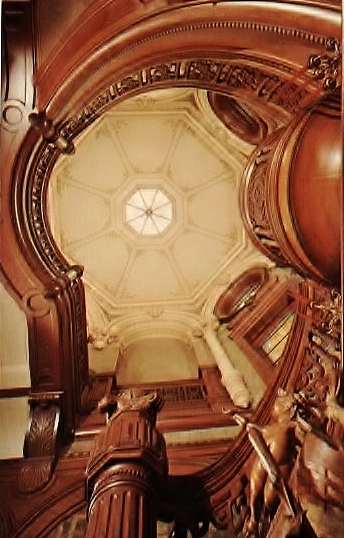 The dome in the Stair Hall. Image from a vintage postcard. The dome atop the Stair Hall is crowned with a lantern (as any self-respecting dome should be), which in the summer months (along with all the other windows in the house) would be open to allow the hot air to rise and the sea breezes to ventilate the living spaces. Galveston suffers from frequent power outages, during which the staff at the Palace opens up the windows and the lantern in the dome; we were told that this method cools the house in a more effective and pleasant way than the window A/C units now in place. Unfortunately the process of opening and closing all the windows in the house requires a large staff, which the Palace currently lacks. The Bishop's Palace. 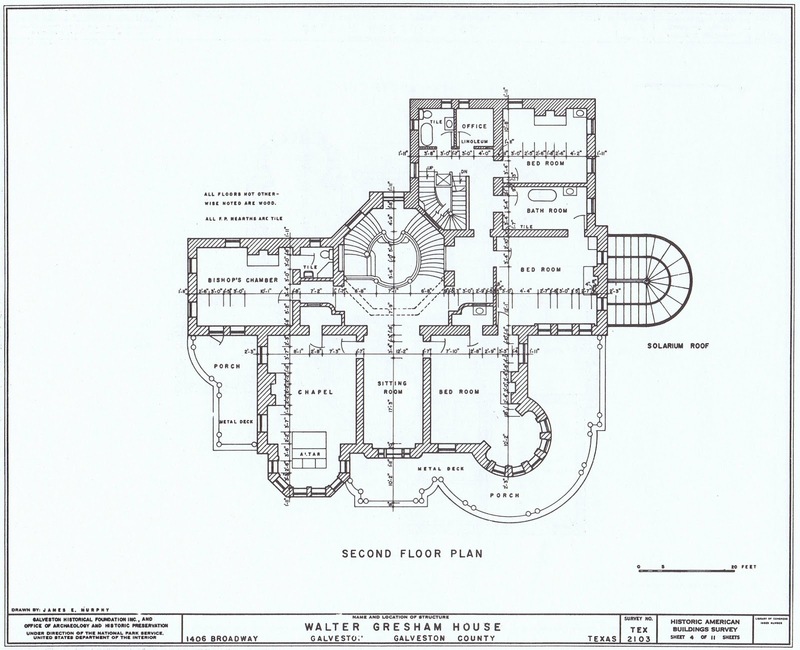 Section through the Stair Hall. The portico of Sacred Heart Church can be seen through the windows of the Solarium. The oculus in the ceiling of the Solarium. 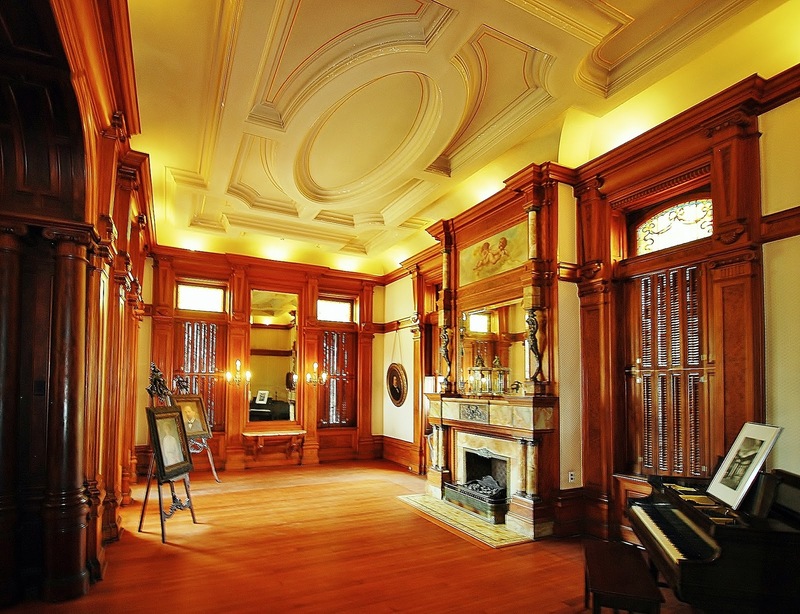 Sturdily built of steel and stone, the old Gresham house survived the Great Storm of 1900. Local lore tells of Mrs. Gresham tethering herself to the porch columns with a rope at her waist, and pulling people out of the river that flowed through the street, and the rubble of the nearby church. 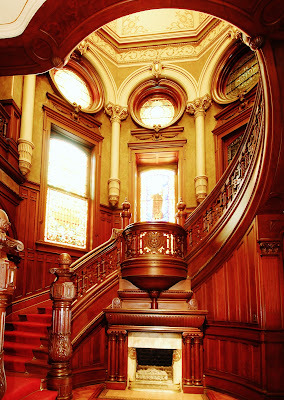 The Palace has since weathered many more storms (including Hurricane Ike, which caused quite a bit of damage) and stands as a testament of the prosperity and exuberance of the people of Galveston. Great piece, Nadia! So interesting and I love the details of the shutters and flueless fireplace. Well done. Why did I not visit when I lived there. I have fallen in love. How did you acquire the drawings? The details are breathtaking! I wish more examples like these would be studied in an academic setting, especially in building technology and environmental system classes. The construction and environmental considerations are as intricate as the details.